The first recorded white men to visit the area were a small party of adventurers headed by John Lederer. The year was 1670. They traveled from Richmond up the James River to present day Lynchburg, then turned south and headed towards present day Altavista, eventually ending at a Saponi Indian village. One year later, in 1671, Abraham Wood led another party into our area. This time the adventurers departed from Petersburg and traveled due west, inventing their own land route instead of using the James River. (It took a lot longer). Finally arriving at the Saponi* Indian village, they proceded to Smith Mountain and went thru the gap, following the Roanoke River northwest. They travelled upriver to Totcro* Indian villages in present day Roanoke and Elliston. Settlers began trickling in soon thereafter. *(The half dozen or so distinct tribes in this area were all related and generally friendly with each other. Communication was not difficult since they all spoke derivations of the Algonquin language. All were expert at sustenance farming (corn, beans, and squash in particular) and all hunted to supplement their diet and provide materials for clothes and tools). The Lake takes its name from Smith Mountain, which takes its name from Daniel and Gideon Smith, two brothers from present day Pittsylvania County who owned thousands of acres here in the 1740's. The gap in the middle of the mountain is entirely natural, having been carved over millions of year by the river. Despite the perfect natural site for a dam, the area has always been very rural, which is probably why the dam, casually proposed after the turn of the century (about 1906), and officially proposed in 1924, took another 40 years to become a reality. 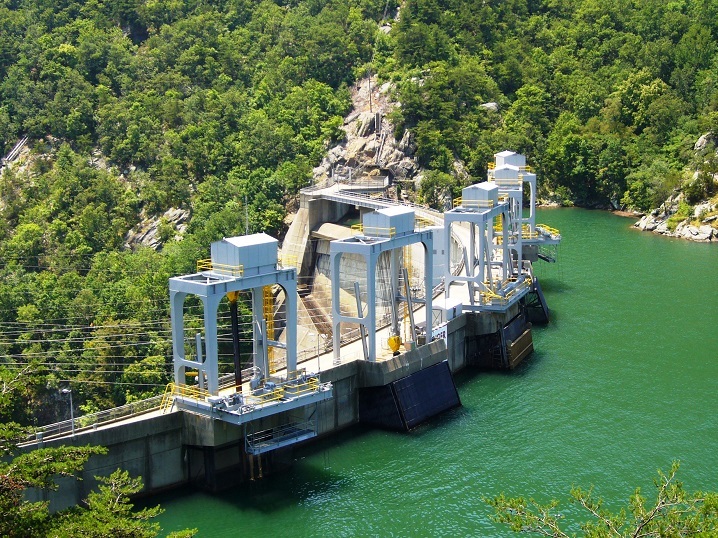 But things have sure changed since the completion of the Dam, because the enormous lake it created has turned the whole area into a retirement mecca, as well as a vacation stop for nearby Blue Ridge Parkway travelers. And it wouldn't be boasting to say that the natural beauty of Smith Mountain Lake is becoming famous. 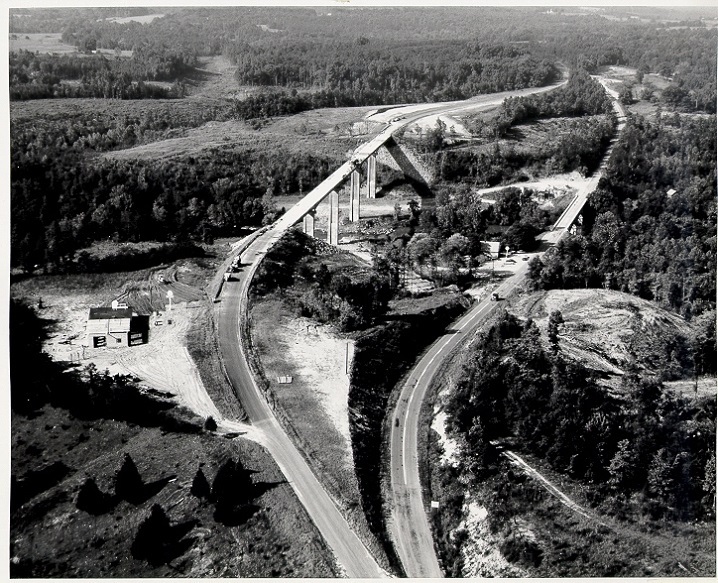 The first black and white shot is Hales Ford Bridge under construction, circa 1964. Notice the old bridge and highway to the right, remnants of which have been underwater 50 years now. Also interesting is the temporary cement plant on the left. Today, this is the exact location of Smith Mountain Lake Realty! 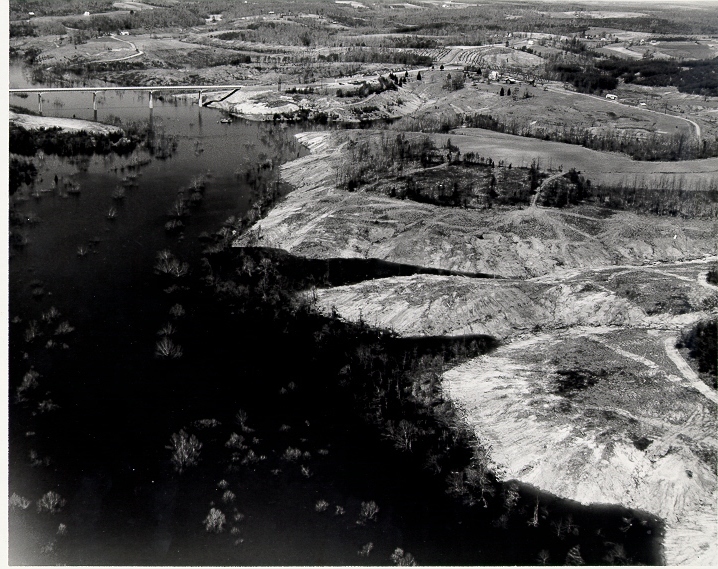 The second photo shows the lake fillfilling up over trees that were left standing. Divers can still see them standing if they go down 100' or so. 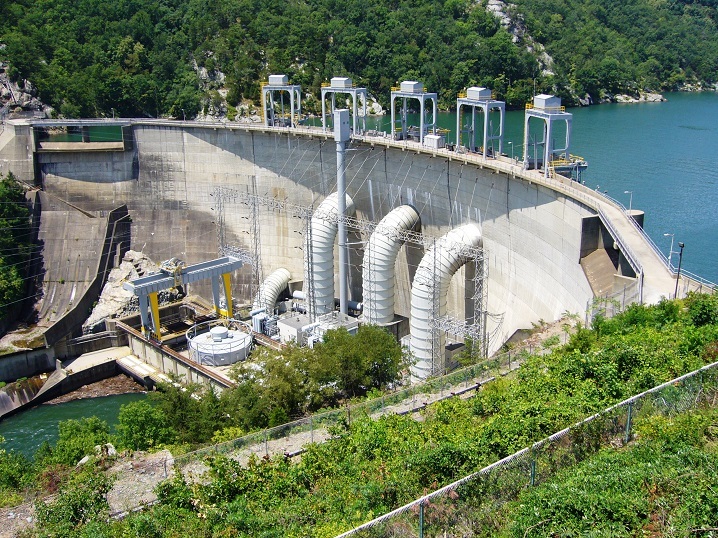 'Front and back of the completed dam.